“This painting dates from the late 1960s, a high-point in the artist’s career. The recognised leader of the Soviet Underground, at the time buzzing with both artists and ideas, he had his own faithful public, easily able to read his codes and metaphors. It was at this time that he found his own poetic language, and simultaneously the need to improvise. It was the very theme of the circus that encouraged Tselkov to combine his tried and tested approach with an element of risk. In speaking of Tselkov’s poetry, I mean the constancy of certain characteristics. In those years his palette definitively establishes itself; artificial, slightly metallic, inspired by Malevich’s late work, almost with the texture of industrial spray-paint; but also his characteristic spatial resolution – an optical effect which in these works has a hint of theatricality. In his circus works this can be explained by the very theme of the spectacle, however this artificiality can also be seen as tribute to Tselkov’s only teacher, the great director and artist Nikolai Akimov. The main feature of Tselkov’s poetry is the incredibly assertive imagery, which he found immediately and remained true to forever after: the red-faced (or ‘scalded’ as his wife so aptly expressed it), aggressive creatures with rotten teeth, human-like but at the same time contradictory to the very idea of humanity. Critics have interpreted the essence of these creatures in many ways. Some saw in them the anthropological expression (or degeneration) of the social experiment which was the Soviet Union. Alain Bosquet saw in them the visualisation of some sort of incarnation of Tselkov as a ‘humourist and incurable terrorist’. The artist himself spoke with a typically modernist and philosophical confidence of the flip side of the divine – faces, in which ‘there is nothing of god’. In the present lot Tselkov’s corporality is both aggressor and victim. 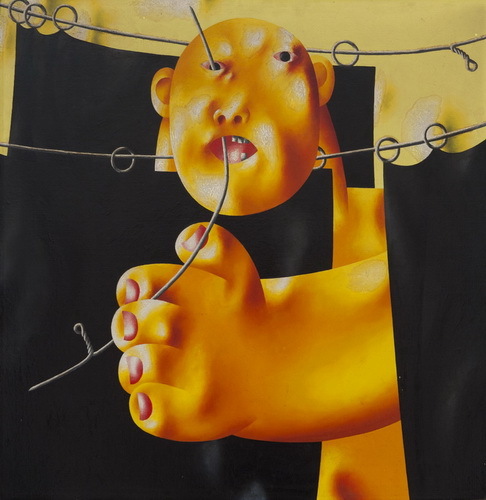 In the Circus Series grotesque faces appear everywhere, at every imaginable turn and angle; but they are have been pinned down by various metal objects; buttons, nails and curtain rings. Critics have described Tselkov’s images as hackneyed, as if his approach were deliberate. I however would speak of matrices which make up the world of his paintings. These matrices have form-defining as well as metaphorical connotations. The corporality in Tselkov’s work is created under pressure according to a given image and form, while at the same time somewhere inside there are processes, independent and unaccounted for, which produce something living. On a metaphysical level this refers to the build-up and the strengthening of the presence of the artist’s images in our visual world”.